Please excuse me if I don’t talk too much today. I am still feeling under the weather and I am not getting much sleep. That usually turns me into a miserable, whiny person but I am actually just too tired to whine. I do, however, have something magnificent to show you! *sigh* isn’t she pretty? I’ve been so upset because I have worn this polish on and off for a while but we had miserable, rainy weather. I think taking photo’s in the sun let’s this polish really show off so the minute a few rays of sun peeked out I grabbed the opportunity to take the photos. It was a very weak and poor show of sunshine but at least I got some photos. Of course, as luck would have it, the minute I take it off we have beautiful sunny days! Anyway, Reclaim is a gorgeous green holo. Green! Holo! I am so in love. 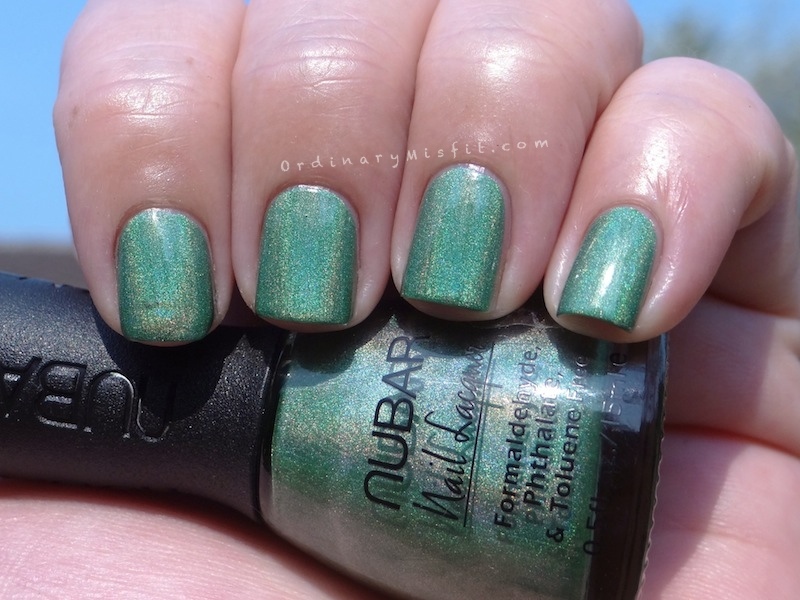 It is part of the Nubar – Going Green collection and I am so thankful that I was spoilt with it. This is also my very first Nubar. For some reason it is near mission impossible to find this brand where I am. Ok just one more photo to show off! Ok, so the topic is ‘Green’ and ‘Flowers”. We have the green covered. I decided to stamp on some flowers using Pueen04 and Essence stampy polish in black for my pinky, index and thumbs and then using the same stamp with China Glaze – Cherished on my ring and middle fingers. The reason why I went with the green on green stamping was mostly because I wanted to see how the two greens would look together. The difference ended up being so subtle. 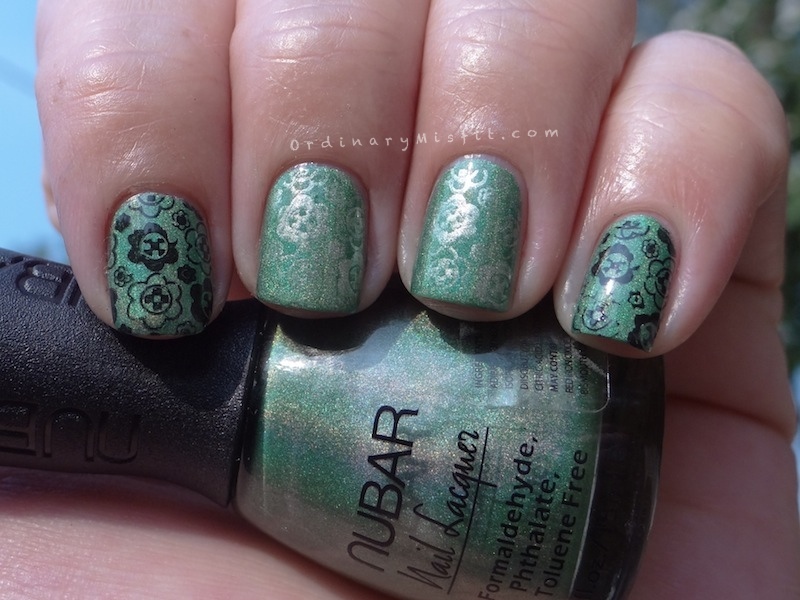 It was nice because in some light you hardly saw the stamping but in others the stamping really stood out. I am sad that the sun was so iffy because I think the holo is much stronger than these pictures show. 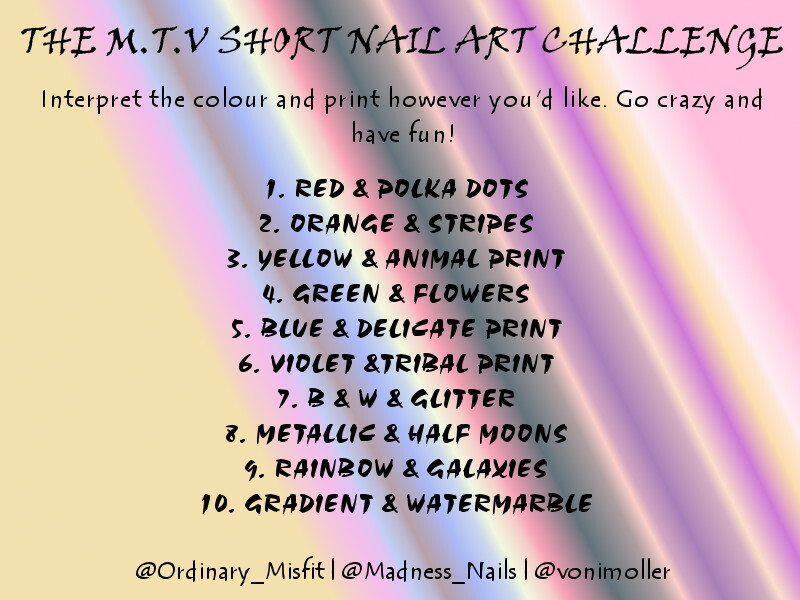 Have you decided to join in on the M.T.V Challenge yet? If so leave your link in the comments so I can check it out and link back to you in these posts. 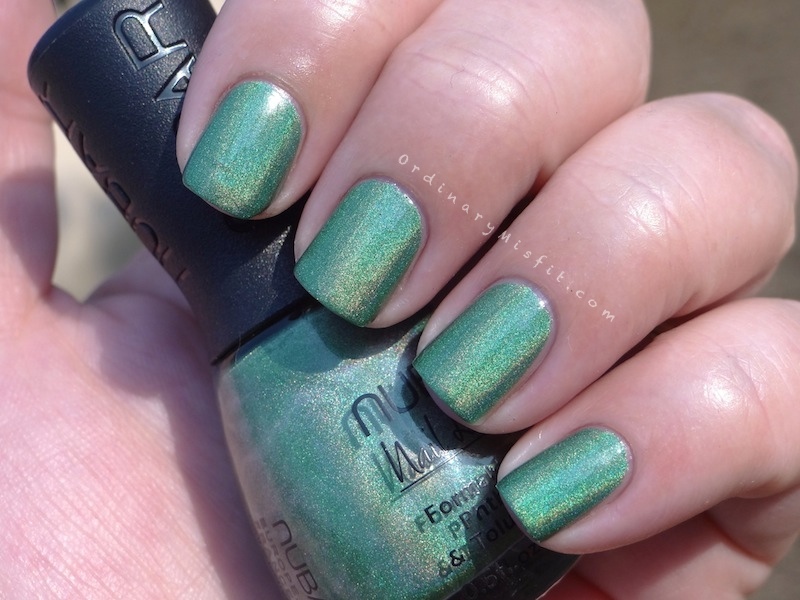 What a gorgeous, gorgeous green polish! 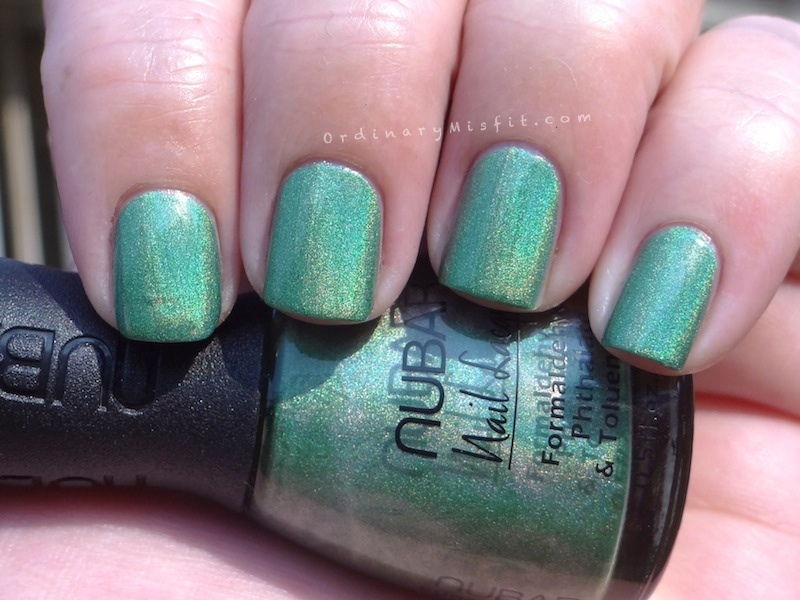 I haven’t seen Nubar polishes here either and now that I’ve seen that I NEED them! I know right? It is so gorgeous! I can’t stop looking at it and touching it. Thank you! Heee, I am really happy you like Reclaim so much M! She is a damn gorgeous little thing isn’t she? 😛 Love the mani though! Seriously! It looks beautiful with the stamping! That holographic colour is absolutely stunning! I bought a few Nubars after hearing good things and was never really all that impressed with them. However, I think Reclaim is one of their most popular colors and for good reason…it is really gorgeous!!! Ohh that is good to know. 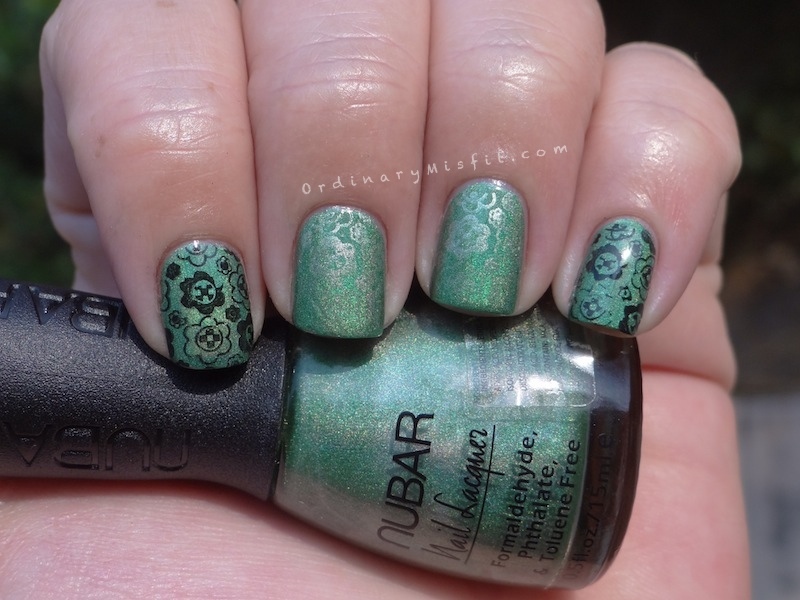 I have also heard good things about Nubar but I struggle to get my hands on it. Reclaim is definitely gorgeous!! Thanks so much!